June is PTSD Awareness Month. Learn more in our first article. 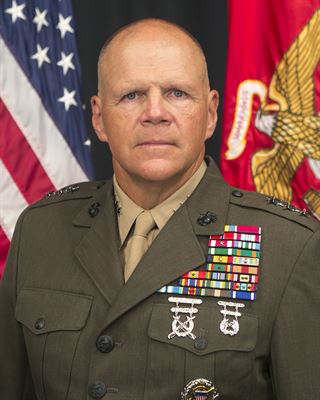 Commandant of the Marine Corps, General Robert B. Neller, recently spoke during the American Psychiatric Association’s 169th annual meeting about receiving assistance from the psychiatric community in fixing what he sees as one of the Corps’ biggest challenges--ending suicide among Marines. A recent survey of approximately 3,000 post-9/11 veterans found that 40 percent of respondents have considered suicide at least once after having joined the military. Eighty percent of those who responded also said that troops dealing with mental health issues don’t receive adequate treatment, both while in the service and after separating. *Image info: Commandant Robert Neller. (USMC photo/released). This week's featured volunteer is a long-serving military supporter from Texas--Christi Hoover. Christi currently serves as the 3rd Battalion Leader for MCRD San Diego. Christi is from a military family (her father and one brother were in the Army, and two other brothers were Marines). 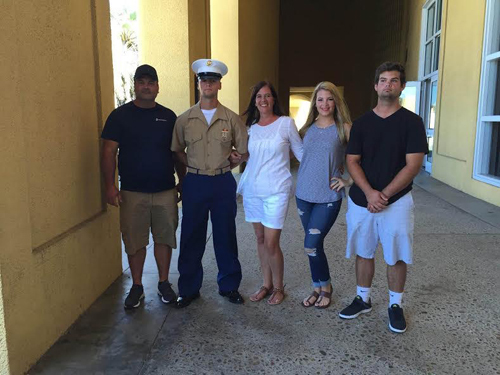 She's happily married with three children, one of whom is her Marine. 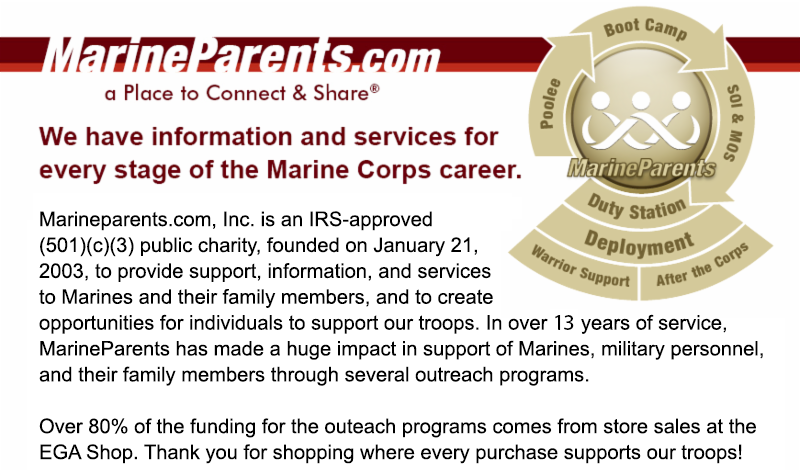 According to Marine Parents Facebook Groups Manager, Teresita Reynolds, Christi is, "an exemplary and dedicated volunteer who provides support and experience to help other recruit families navigate the boot camp experience" with "infectious enthusiasm." *Image info: Christi Hoover (center) and her family. 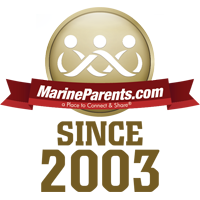 This week's TMP featured participant is a proud Marine mother from Illinois--Machelle Ketterhagen. 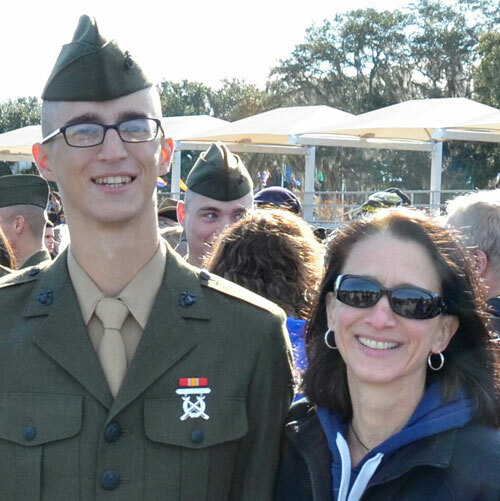 Machelle's son graduated from boot camp in December of 2015, a moment that Machelle calls the "proudest" of her life, and is now attending the Defense Language Institute in Monterey, California. When Machelle decided to run her first marathon last year, she hoped to get a bib for the Marine Corps Marathon, but she wasn't chosen. 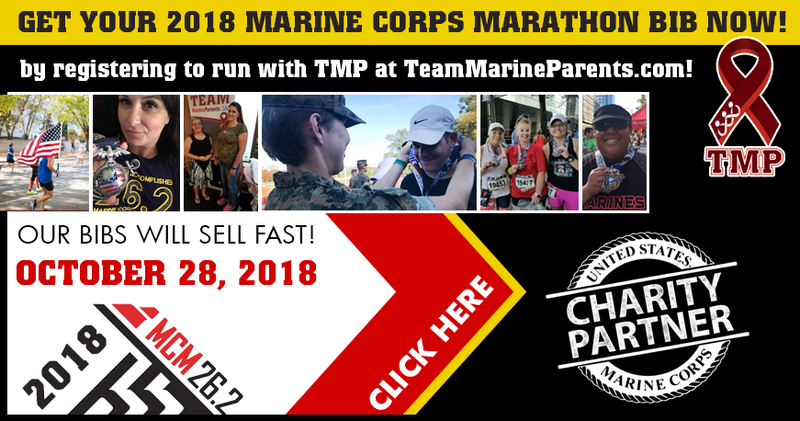 This year, when Machelle saw that she could get a guaranteed spot in the Marine Corps Marathon by joining TMP and raising funds for the outreach programs of MarineParents.com, she decided to sign up. So far, Machelle has raised $480 of her $500 fundraising goal. Thank you, Machelle, for being a part of the team! Good luck in October! *Image info: Machelle Ketterhagen and her Marine son. Last week, the founder of History Flight, a Florida-based non-profit organization, announced that it has found the remains of 13 more World War II Marines on Tarawa Atoll in the Pacific nation of Kiribati. According to Mark Noah, head of Marathon, History Flight, 12 sets of remains were found on Tarawa between January and March and the 13th set of remains was found last week. 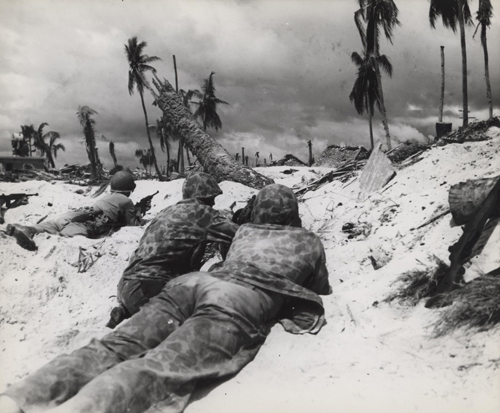 The Battle of Tarawa, which saw some of the most bitter fighting in the Pacific Theater, claimed the lives of more than 1,000 Marines and injured more 2,100 more. *Image info: Marines landing on Tarawa beach advance toward Japanese pill boxes, November, 1943. (Official USMC photograph/released). Two years ago, Vietnam Marine veterans Steve Colwell and Nick Warr were attending a reunion for the 1st Marine Division at Camp Pendleton, California. 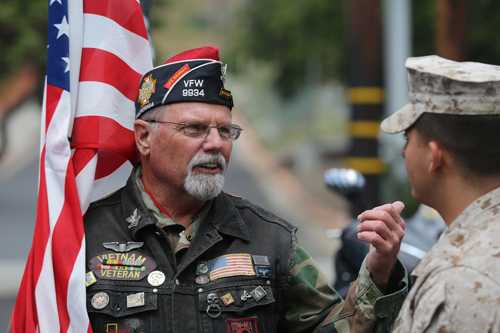 While there, the two men stopped at the Memorial Garden at Camp San Mateo, which serves at a tribute to the "Fighting Fifth" Marine Regiment. Colwell, 72, who served as an officer with the 1st Battalion, 5th Marines, and Warr, 71, who served as an infantry officer with Charlie Company in the 5th Marines, noticed during their visit to the garden that there was nothing in the garden recognizing the Marines who lost their lives in Vietnam. Last Friday, Colwell met with Brian Coty, a board member from the Dana Point 5th Marine Regiment Support Group and Lieutenant Colonel Rafael Candelario, acting commander of the 5th Marine Regiment, to finalize plans for a $400,000 Vietnam War Monument they hope to unveil at the camp on Memorial Day 2017. The six-panel granite monument will honor the 2,706 Marines, Navy corpsmen, and chaplains who were killed in Vietnam while serving in the 5th Marine Regiment. Their names will be etched on the panels surrounding a 14-foot-tall black granite spire. Additionally, the image of the battle cross–-a helmet, a rifle, a bayonet, and boots--will be etched on all four sides of the granite. *Image info: Bob Pruitt speaks with a Marine before the start of the 3rd Battalion, 5th Marine Regiment “Dark Horse” Reunion at the San Mateo Memorial Garden at Marine Corps Base Camp Pendleton, California, April 29, 2016. (USMC photo by Lance Corporal Shellie Hall). Twenty-five years ago this week, on May 29, 1991, elements of a joint task force that included the 5th Marine Expeditionary Brigade departed the South Asian nation of Bangladesh after nearly two weeks of disaster relief operations following Cyclone Marian, which resulted in more than 136,000 fatalities. The task force delivered relief supplies using helicopters, C-130s, and landing craft in Operation Sea Angel. 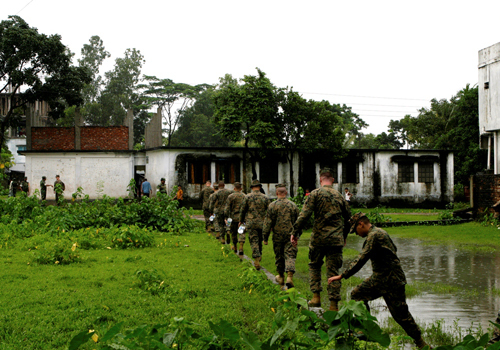 *Image info: U.S. Marines walk to the site from which they conducted, in coordination with the Government of Bangladesh and along with elements of the Bangladesh Armed Forces Division, an engineering civil action project exercise to expand the second story of a school shortly after Cyclone Marian struck the Chittagong district of southeastern Bangladesh in April, 1991. Ninety-eight years ago this week, on June 2,1918, the German 28th Division attacked American troops on the Paris-Metz Road, hitting the American 2nd Division, including the 4th Marine Brigade. 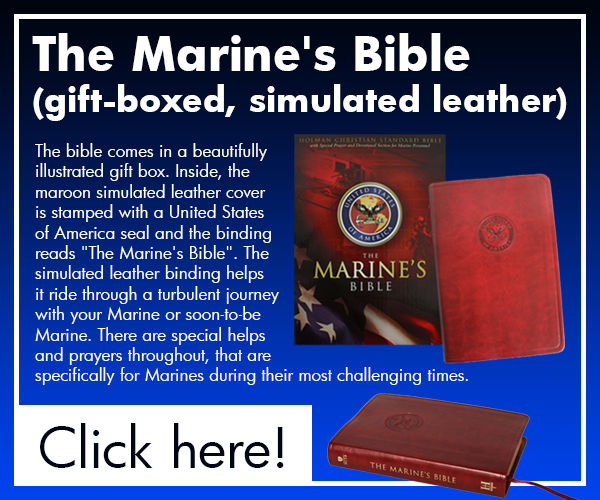 The Marines opened fire with deadly accuracy, helping hand German troops a setback that set the stage for Marine victory at Belleau Wood which would soon follow. *Image info: A recruiting poster by Charles B. 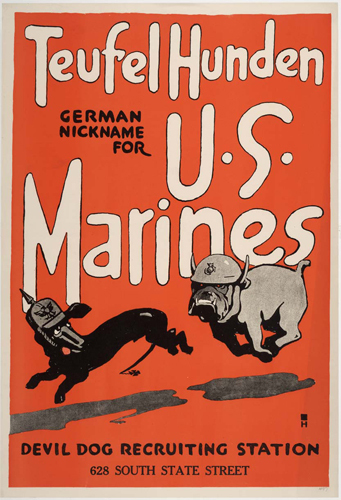 Falls makes use of the "Teufel Hunden", or "Devil Dog", nickname given by German troops to American Marines for their ferocious fighting style.